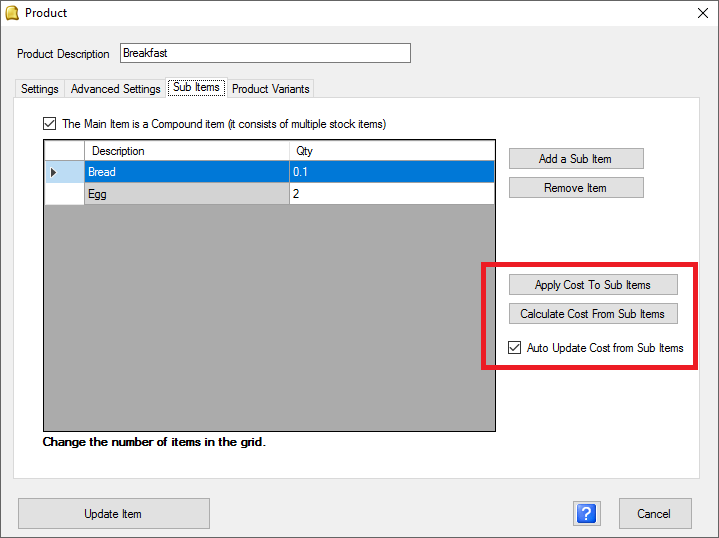 You can also choose to let ROBOTILL automatically adjust compound item cost prices if a sub item cost price changed. 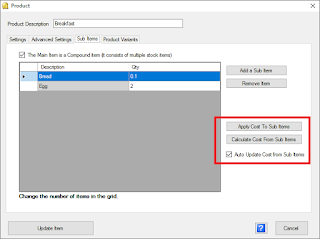 For example, if you have various items that uses a slice of cheese as a sub item, and the cost of a slice of cheese changes, then ROBOTILL will automatically recalculate all the items that uses a slice of cheese. See Product Cost in the Online Help for more information. This feature isalso available in the FREE Point of Sale Edition of ROBOTILL. Barcodes of deleted stock items are now freed up and can be used again. Minimum stock level fix (check used a '<=' check instead of a '<' check). If a cashier logged into two different computers at the same time and voided a sale that was open on both computers it caused problems - this is now fixed.